My wife and I used this on the interior walls of our log him. If gave us the finish we were looking for without making it too glossy. The finish was great! Thank you so much! Our wood floors had an old oil-based finish on it and were showing some wear. We applied 1 coat of Sure Shine, lightly sanded it, then applied another coat of Sure Shine, and allowed the floor to dry. It turned out really beautiful! Very pleased with Sure Shine clear interior finish! We chose the gloss version of Sure Shine for our flooring and the satin version of Sure Shine for our utility room and bathrooms. Looks great and was easy to apply with a stain brush. Another great product! 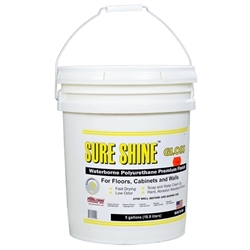 Sureshine was the easiest product for a typical homeowner, as myself, to apply. There was no smelly fumes making you leave the house. It dried within a couple hours and clean up couldn't have been easier. We walked on it for a week with just socks, as a precautionary measure, to make sure it cured well. On the high traffic areas, which included pets and lots of foot traffic, it did show some wear but that was to be expected.